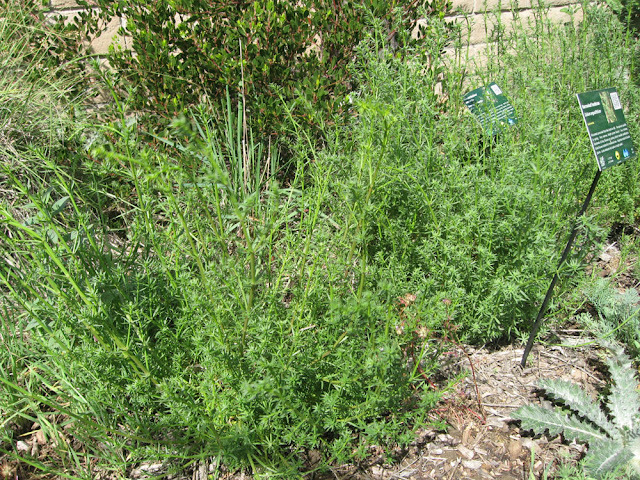 An overall dry winter, with occasional bouts of rain, has many plants confused as to season. Hard to blame them; we’re a bit confused ourselves. One perennial that’s getting ready to bloom is the Narrowleaf bedstraw, Galium angustifolium. Its cheery flowers can be seen this month in both Mother Nature’s Backyard and the Garden of Health. 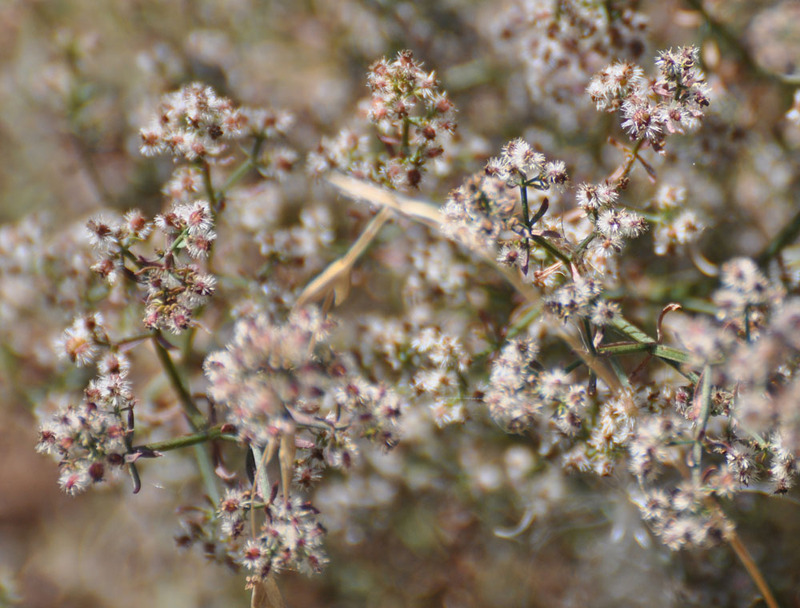 Around 40 species of bedstraw are native to California, according to CalFlora . In addition to Galium angustifolium, the following are native to Western Los Angeles County: Phloxleaf bedstraw (Galium andrewsii), Common bedstraw (Galium aparine), Box bedstraw (Galium buxifolium – Channel Island species), Santa catalina island bedstraw (Galium catalinense – Channel Island species), Santa Barbara bedstraw (Galium cliftonsmithii), Climbing bedstraw (Galium nuttallii), Graceful bedstraw (Galium porrigens) and Threepetal bedstraw (Galium trifidum). 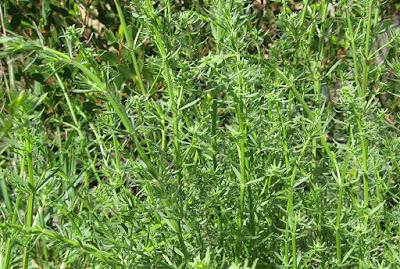 The most common locally are Galium angustifolium, G. aparine, G. nuttallii and G. porrigens. 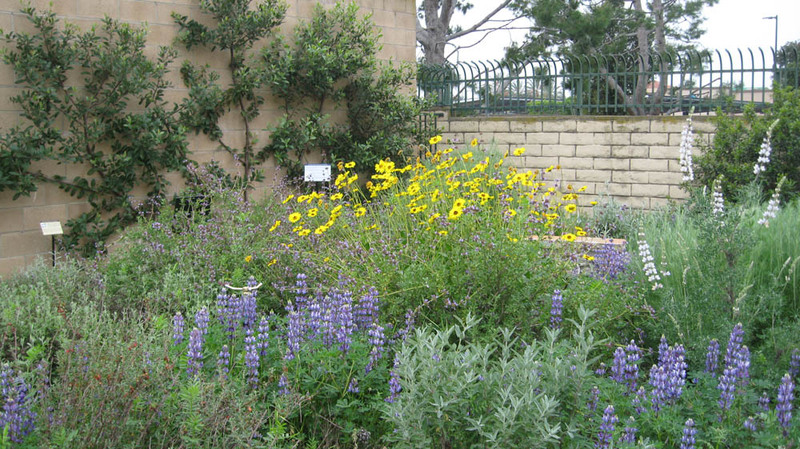 An additional 9 or 10 species can be found in the San Gabriel Mountains of Los Angeles County. Galium angustifolium is one of the most common bedstraws in S. California and Baja California, Mexico. It includes eight recognized sub-species, some of them narrow endemics. 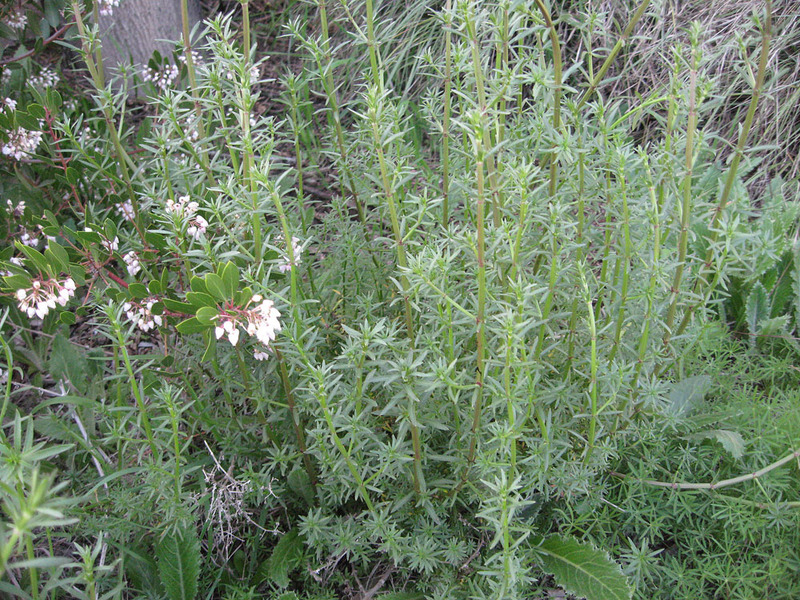 Like most California bedstraws, Galium angustifolium is an herbaceous perennial. Amongst the California species, only 4 are annuals, and a few others are large enough to be called shrubs or vines. If you want to plant a bedstraw in your garden, Narrowleaf bedstraw is a pretty good representative species. The genus Galium, which is found in temperate climates throughout the world, is one of the larger genera in the Family Rubiaceae, the Madder or Bedstraw Family. While bedstraws were well known in past eras, they are little remarked upon today. 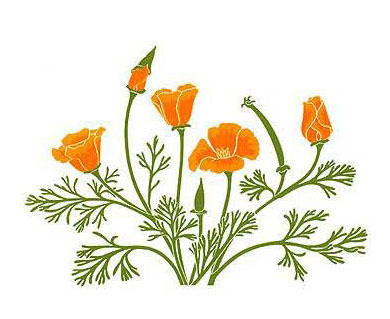 They are not as showy as some of the better known California natives, and their useful attributes have fallen out of favor. So while they are common – you’ve no doubt seen them when hiking in the local mountains – they don’t receive much press today. And that’s a shame, since they are good little garden plants. Narrowleaf bedstraw is a rather delicate-appearing perennial or sub-shrub that grows to 1-3 feet tall and 2-3 feet wide. It is notable for its many slender branches and narrow leaves, which give the entire plant an open appearance. The general shape is mounded to slightly sprawling. The bases of the branches become woody; the ends are always herbaceous. The leaves are very narrow, bright green becoming medium green, arranged in whorls of four at intervals along the stems. 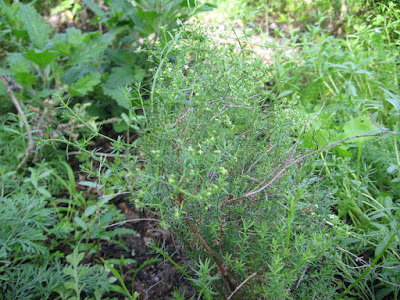 The number of leaves per whorl – and its perennial lifestyle – distinguish it from the Common bedstraw, an annual with six to eight leaves per whorl. 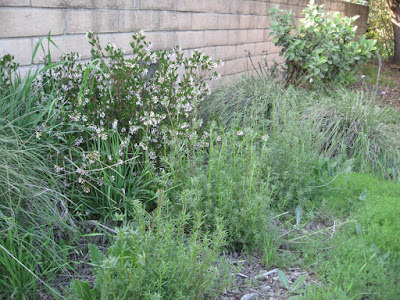 With summer water, Narrowleaf bedstraw can be evergreen; in water-wise gardens like Mother Nature’s Backyard, it becomes dormant during the dry season (usually about August). You can cut it back then, or just leave until the fall pruning season. It quickly leafs out and grows in early spring. Narrowleaf bedsraw blooms in the spring – anytime from March to May in western Los Angeles County. 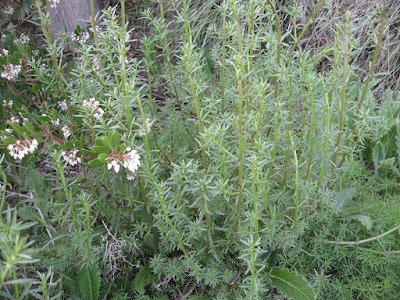 The plant is dioecious; male and female flowers grow on separate plants. That means you’ll need at least one of each in a garden to produce viable seeds. 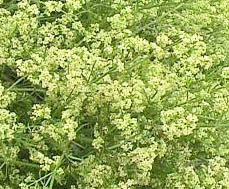 The two flowers look similar: both are small, yellow-green to pale yellow, in dense clusters. In a good year, plants will be covered in blooms (see above). The mature flowers are hairy, as are the seed capsules - small nutlets with straight, bristly hairs (which allow them to latch onto passing animals for distribution). We’ll try to get some good nutlet photos this year. 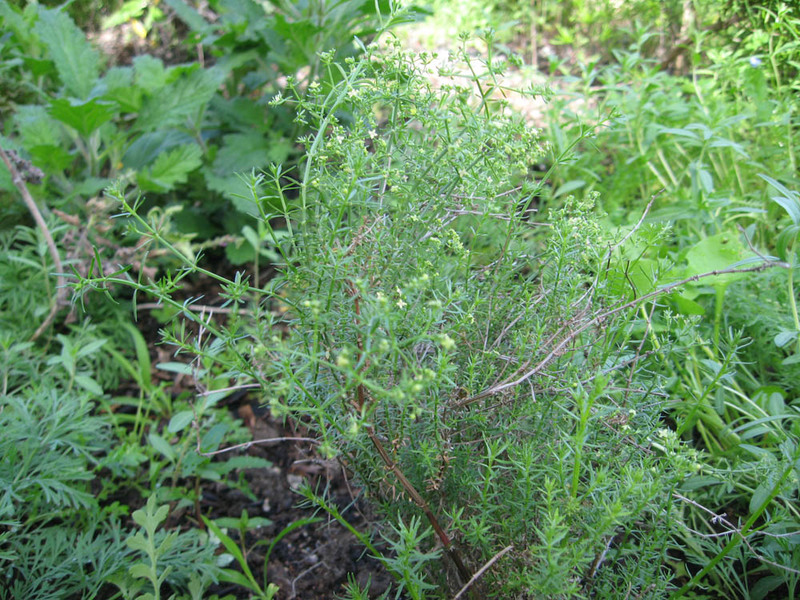 Narrowleaf bedstraw is not at all picky or difficult to grow. In fact, it’s much sturdier than you might guess from its appearance. While this species normally grows in rocky, well-drained soils we’ve have no problems with it in clays. It likes some afternoon shade in hot gardens, and does well in high shade or to the east of larger shrubs. It can take anything from moderate to infrequent water. We prune ours back to about 8 inches in the fall to encourage a bushy shape. That’s just about all the management that’s needed. We love this plant as a filler in gardens that range from informal to semi-formal. It’s an excellent choice for mid-beds, where its green foliage and flowers are appreciated in spring. The foliage provides a nice contrast to garden shrubs (see above). There really is nothing that looks quite like this plant. In the past, the dried foliage of Galium species was used to stuff straw mattresses, imparting a fresh, sweet scent. We’ll dry some and try it in a natural pillow. 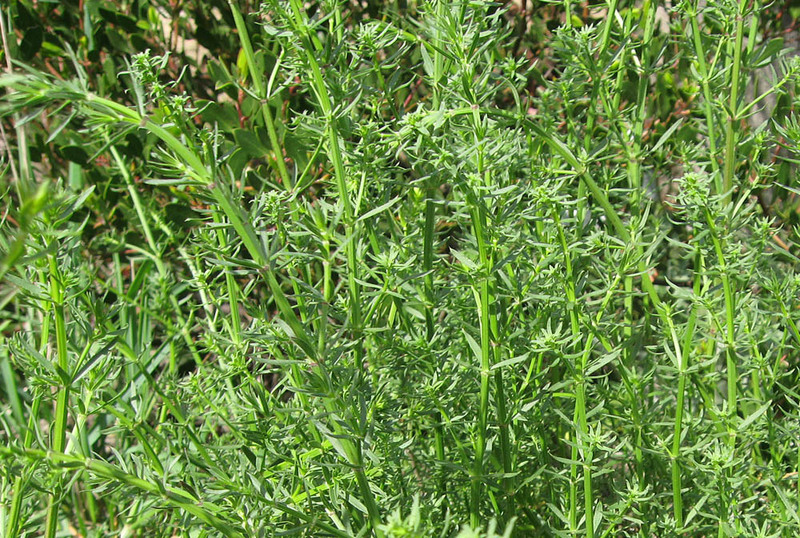 Galium angustifolium is likely utilized as a larval food by several moth species. We’ll try to keep an eye out for caterpillars and update with our findings. 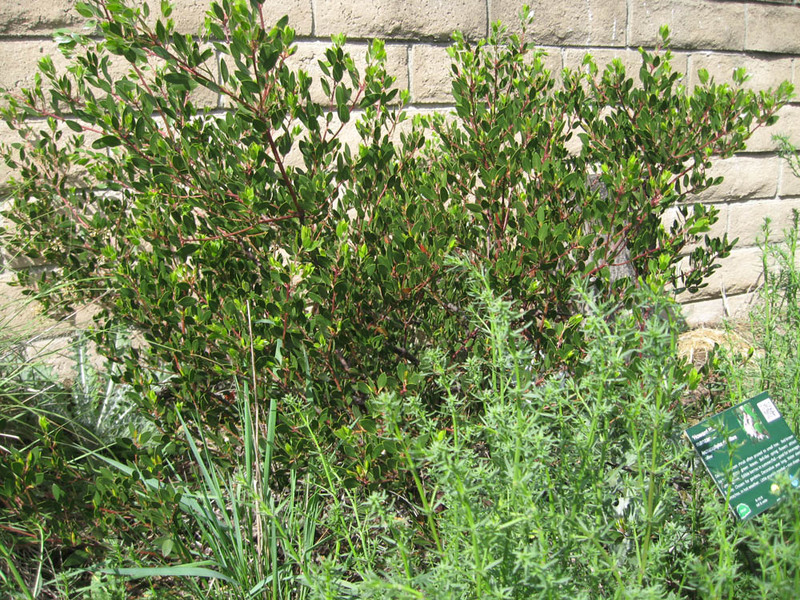 A tea made from the foliage, with or without flowers, was used as a traditional medicine for diarrhea by the Kumeyaay or Southern Diegueno Indians . The foliage could be used fresh or dry. We’ll dry some and give it a try when the need arises! In summary, Galium angustifolium is an interesting filler plant suitable for S. California gardens. It’s green foliage and cheery blooms are a welcome sight every spring. It can be tucked in around shrubs, and it’s rumored to have both habitat and medicinal value. For some reason, we’re captivated by this unassuming little plant – and hope you will be too.